This recipe is from one of my favorite blogs, Sugarcrafter. 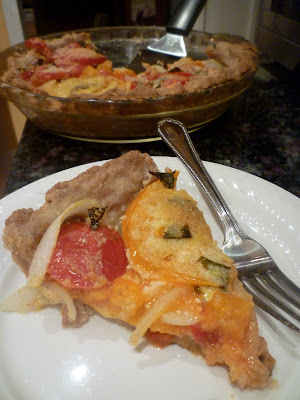 Tracy has some amazing recipes on her blog, and I always look forward to a new post from her. When I saw this tomato pie recipe last week, I knew I had to make it as soon as possible! Do make sure to check out the original recipe (and the photos from Sugarcrafter because they're way better than mine!). I changed the recipe slightly though, so the ingredients listed below are actually what I used when making this. The original recipe calls for mozzarella cheese, but because I only had colby jack on hand, I just used that. I also did not have garlic scapes, so I used fresh garlic cloves (thinly sliced). And finally, I added some fresh basil to the pie also, and I omitted the mustard. For the crust, whisk together the flours and salt in a large mixing bowl. Cut in half of the butter with a pastry cutter until the pieces are pea-sized. Next, cut in the second half of the butter, leaving larger pieces of butter. Add the water, a few tablespoons at a time until the mixture comes together to form a dough. Press it into a disc, about an inch thick, and wrap in saran wrap. Let rest for 20 minutes (I actually put my dough in the fridge for 20 minutes, but looking back the recipe doesn't actually say to do that. I thought it did though!). Preheat oven to 400 degrees and roll out the dough to fit in a 9-inch pie plate. Press into the dish, and trim any extra dough around the edge. Top the crust with your cheese slices. I went "easy" on the cheese. You could definitely add more than I did. Put one layer of tomatoes on the cheese. Top the tomatoes with some of the sliced garlic and basil leaves, then add your sliced onions. Put another layer of tomatoes on, followed by more garlic and basil. Lastly, sprinkle with parmesan cheese and drizzle with olive oil. I really didn't fool much to make the dough look good. I was going for quick and easy here! No fuss needed with this recipe. Nothing needs to look perfect! I was glad I had both yellow and red tomatoes on hand. It made the pie look so pretty, I thought! And the oh-so-delicious addition of parmesan cheese. All baked and ready to dig into! Mike and I reeeally enjoyed this pie. It was very easy to make. The dough for the crust only took a few minutes to put together, and it was very easy to form. And it was delicious to boot! Very tasty savory pie crust. We got eight slices out of the pie. I forced myself to only eat one slice for dinner the night I made this though. I feel like I could have eaten two or three; it was so yummy!